We are offering Braided Copper Jumper to our clients. 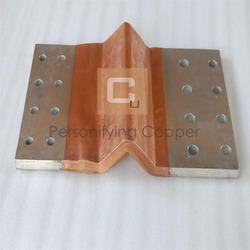 We are the biggest and largest Manufacturers and Suppliers of Copper Jumper are suitable for Earth Bonding. It can be supplied as Standard Drilled & Pre-Cut Bonds. Braids made of many copper wires are also sometimes used for flexible electrical connections between large components. High Quality Copper Braided flexible Jumper provide minimum power loss with high quality stability & high durability. 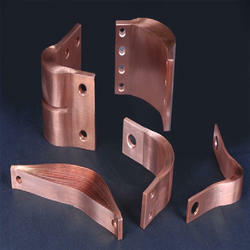 Elcab Manufactures braided Copper Jumpers from 99.97% pure copper. These are made as per customer drawings or as per customer application. We manufacture, supply and trade Jumper& Clamps to nationwide market. It is used to charge the battery and to transfer the current in the vehicle. These Jumper &Clamps is vitally used in all vehicles in foreign countries. We offer finest quality Jumper& Clamps at a very affordable price. In order to fulfill the diverse needs of our clients, we are manufacturing and supplying a qualitative array of Copper Jumpers. Busbar Connector In High Voltage Electric Busduct . Keeping in mind ever-evolving requirements of our respected clients, we are offering a premium quality range of Copper Flexible Shunts.